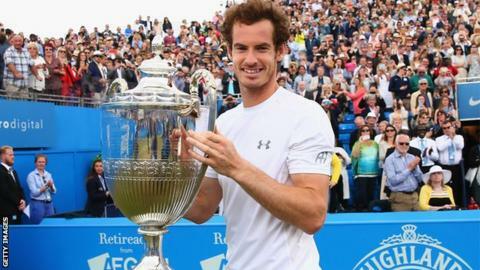 Britain's Andy Murray wants to win a record fifth Aegon Championship title at Queen's Club this summer. The 28-year-old world number two confirmed on Tuesday he will defend the trophy he won for a fourth time last year with victory over Kevin Anderson. There have been eight four-time champions, including John McEnroe, Boris Becker, Lleyton Hewitt and Andy Roddick in the open era. "If I could win it for a fifth time it would be amazing," said Scot Murray. "The names that have won it four times - they are all great tennis players." Murray, champion in 2009, 2011, 2013 and 2015, made his debut at Queen's in 2005 and used the club's clay courts to prepare for Great Britain's Davis Cup final victory over Belgium in November.